The fauna of Nevis is intertwined with the island's history, with everything from breadfruit to cotton having a story to tell. There is something about contemplating a mass of pink bougainvillea draped across a whitewashed wall that is unerringly satisfying. The scarlet red of the hibiscus flowers lures hummingbirds and butterflies, and in the summer months the flamboyant trees light up the island. Everywhere on Nevis there are splashes and dashes of colour, so many revealing a part of the island’s history. Look out for the knobbly bark of the ‘monkey-no-climb’ tree, the hura crepitans: less than two hundred years ago slaves were strapped up against these merciless trunks and brutally flogged by their masters. And you don’t need to venture far into the forests to see trees laden with breadfruit, the seeds of which were brought to the island from Tahiti by Columbus in order to feed those same slaves. Many couples retreat to Lovers Beach to enjoy the romantic solitude of the private inlets, but beware the poison apple, the hippomane mancinella, with its acidic milky sap. Columbus was the first to record the excruciating effects of this viscous substance, noting that some of his men suffered permanent blindness after it dripped onto their faces as they slept. On Nevis, the bursera is rather wonderfully known as the ‘tourist tree’ because it is always red and peeling, and the bright red leaves of the evergreen acalypha wilkesiana have lead it to be daringly called ‘match-me-if-you-can’. The pretty pink and white oleander bushes are ubiquitous on the island, their soft colouring no betrayal of the deadly poison within. In the 1700s, many of the French soldiers who invaded the island became seriously ill or died after skewering meat for a barbecue on the willowy branches of the oleander. Everywhere there are bath nettles and mountain holly waiting to cause your skin to erupt in painful, purple blisters; the castor bean plant is the source of ricin. With so much flora seemingly intent on causing significant bodily harm, it’s frankly something of a miracle that Nevis has remained populated at all. But there’s also the ‘icky ticky jumbly thyme’ that is used across the island to make a delicious chicken dish; soursop is believed to cure cancer, and the silverback leaf goes one step further and allegedly cures everything. The bulbous baobab trees are a reminder of the African roots of so many of the islanders, and enormous ‘elephant ear’ leaves of the enterolobium cyclocarpum provide welcome shade. The rainforests are bursting with fruit trees, with mangoes and avocados and papayas joining the breadfruit in weighing down branches. Bananas and coconut palms grow everywhere, and pineapples thrive in the constant sunshine. It was sugar plantations that made Nevis into the Queen of the Caribees in the eighteenth century; the production of sugar finally ceased in the 1950s and sections of the fields are now used to grow cotton and coconuts. There is something irresistibly romantic about watching palm fronds silhouette against a sky brushed red by a setting sun, and perfect visions of paradise frequently involve a palm tree, white sand, and an emerald sea. But these are merely the edges of Nevis and you must head inland for other finds: the overwhelming scenes of flamboyants in the church of St John’s in Fig Tree; the intoxicating scent of frangipani ‘bridal bouquet’ flowers at dusk, and the pleasure of reaching for a soft ripe papaya up on the rainforested slopes of the mountain. 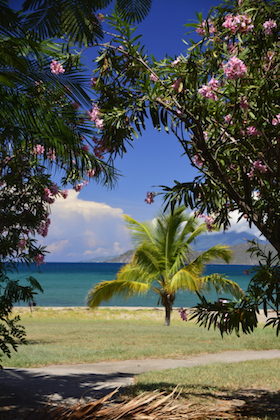 Nevis has a garden of tropical delights for anyone who ventures off the beaten path.